Times of deep trial and testing are definitely heavy and burdensome. However, it seems to me that it is the daily burdens that we bear that are especially trying and wearisome. Daily burdens can be as mundane as the seemingly endless piles of laundry, the never ending sinks full of dirty dishes, referreeing squabbles between your children, the stresses of your nine to five job, or the challenges that arise in our day to day relationships. It is the repetitive, never ending dailiness of our responsibilities and burdens that can wear us out and wear us down. I am so thankful, so amazed, that God bears with me and bears my burdens day after day, week after week, month after month, and year after year. Yet, He never gets weary and gives up on me. He never quits. He never decides that I'm just too much trouble. He never leaves me or forsakes me or lets go of me. 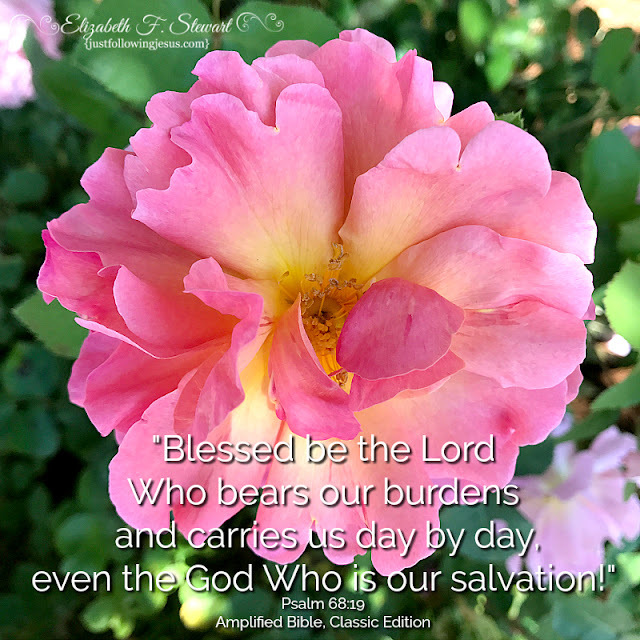 I'm so thankful that He is perfectly steadfast, faithful, and loving toward me, no matter how burdensome I may think I am and no matter how many burdens I bring to him or cast at His feet. I am so thankful for the fact that God bears my burdens and carries me day by day and that I can rely on that. What a blessed relief! Yes, sometimes the little things from day to day can seem like heavy burdens. So thankful for a God that loves me so much and gives me new mercies each morning to see me through! I totally agree! I couldn't make it through life's challenges without God!